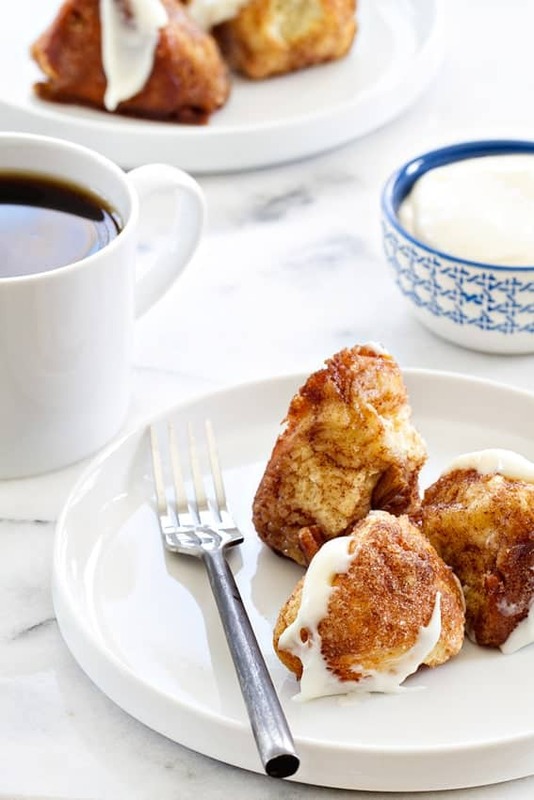 Beginner’s Cinnamon Pull-Apart Bread is just the sort of coffee cake to beat your yeast phobia. It’s so simple, you can make it with the kiddos in an afternoon! This is a sponsored post on behalf of Fleischmann’s® Yeast. 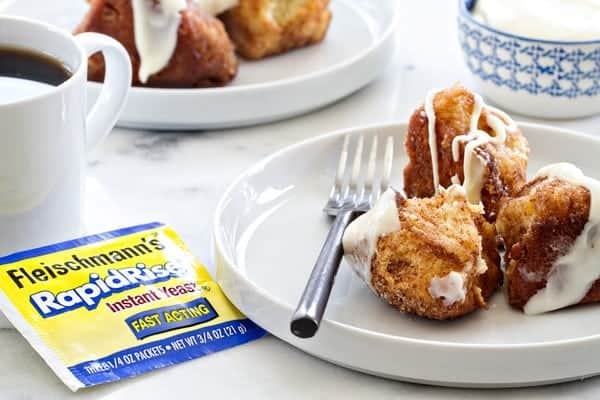 I’m a Bake a Little Extra Blog Ambassador, sponsored by Fleischmann’s® Yeast. All opinions are my own. I’m not really one that goes in for resolutions, at the start of the year, or any other time. It’s not that I have a problem with folks that do, I just know myself. Change of lifestyle can’t be sudden, full-stop, and forced. I’ve got to ease into it. Over the last year, I’ve tackled lots of things I never thought I would. I got a spin cycle for my house, and I use it all the time. After becoming somewhat of a hermit pretty much immediately after I left my teaching job to work on MBA full time, now I force myself to get out of the house nearly every day – either for activities with Elle, or my sacred, solitary Target run. All stay-at-home parents need trips like that, amiright?! And one of the things I’m most proud of in 2015 is tackling my fear of yeast baking. I’ve made Caramel Apple Cinnamon Rolls and Potato Rolls, and Honey Nut Rolls with ease. 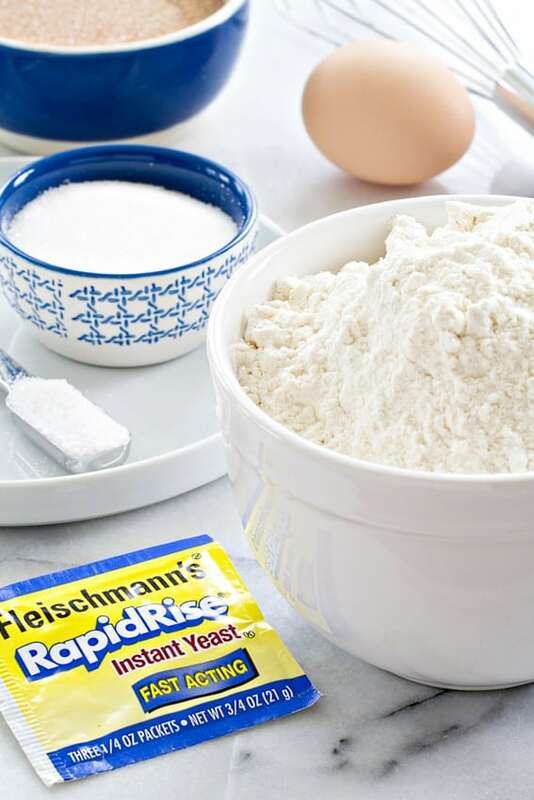 When you’re working with quality products like Fleischmann’s® RapidRise™ Yeast that’s ready to rock every time you tear open the package, it’s pretty easy to get over your fears. And I want the same for you in 2016. So we’re easing into it. With delicious, delectable Beginner’s Cinnamon Pecan Pull-Apart Bread. Everyone’s had Pull-Apart Bread (sometimes it’s called Monkey Bread) at some point. And there are a thousand variations – even savory garlic and cheese ones. But I’m a sucker for the original recipe, so that’s what we’re making here. Except that I wanted a deeper, more earthy flavor from this Fleischmann’s® recipe, so I switched it up a little to add some brown sugar, pecans and a drizzle of sweet cream cheese frosting. How could anyone possibly resist this combination? This is one of those baked treats that’s suitable for breakfast, over coffee, or at 3 o’clock in the afternoon, when you’re desperate for a pick-me-up to get you through dinner with your cup of tea. What’s really wonderful is that you can make the dough ahead of time. If you’re having a big brunch? Make this Pull-Apart bread dough the night before. You’ll be ready to go first thing in the morning, and get to hit the snooze button at least once before guests arrive. And if you Bake a little extra, you can send your guests home with a few pieces to enjoy later. Now, I know a lot of recipes for Monkey Bread call for those tubes of biscuit dough. I’m no stranger to a shortcut, and I won’t say you should never do that. But I’m asking you to make fresh, homemade dough for this cake at least once in your life. The flavors are SO much better! There’s a deeper, yeasty deliciousness that just can’t be matched by that tube full of shortcuts. Especially given this dough is incredibly easy to make. I whipped up this gorgeous Beginner’s Cinnamon Pecan Pull-Apart Bread early one morning with my baby girl. Her daddy was still fast asleep, so we got to work in the kitchen bright and early. It really is easy enough that a toddler can do it. By the time Eric climbed out of bed, this coffee cake was bubbling up in our oven, the heavenly scents wafting through our entire house. I like to remind the man why he married me, is what I’m saying. But also, baking up breakfast like that for my sweet family is something that brings me great joy. Creating a scrumptious breakfast from nothing but flour, water, yeast, sugar, and butter is straight up magical in my eyes. If you love baking as much as I do, I’m sure you feel the same. You’ve got to try this Beginner’s Cinnamon Pecan Pull-Apart Bread – whether you’re just starting out, or a seasoned baker, you’re going to love it! Combine 2 cups flour, sugar, dry yeast and salt in a large mixer bowl and stir until blended. Combine milk, water and butter in a microwave-safe bowl. Microwave on HIGH in 15 second increments until very warm but not hot to the touch (120° to 130°F. Butter won’t melt completely). Add to flour mixture with egg. Beat 2 minutes at medium speed of electric mixer, scraping bowl occasionally. Add 1 cup flour; beat 2 minutes at high speed, scraping bowl occasionally. Stir in just enough remaining flour so that the dough will form into a ball. Knead on lightly floured surface until smooth and elastic and dough springs back when lightly pressed with 2 fingers, about 6 to 8 minutes. Cut dough into 36 pieces. Dip each piece into the melted butter and then roll in the cinnamon sugar mixture. Place in fluted tube pan that has been generously sprayed with cooking spray. Sprinkle pecans in between each layer of dough balls. Combine any remaining butter and sugar and drizzle over rolls. Cover with towel; let rise in warm place until doubled in size, about 45 minutes. Bake in preheated 375ºF oven for 25 to 30 minutes or until rolls are golden brown. Cool 5 minutes in pan, then invert on serving plate. Prepare the Frosting: In a medium bowl with an electric mixer, beat cream cheese and powdered sugar until smooth. Add in vanilla and 1 tablespoon of milk, beating until well combined. Gradually add more milk, one teaspoon at a time until desired consistency is reached. 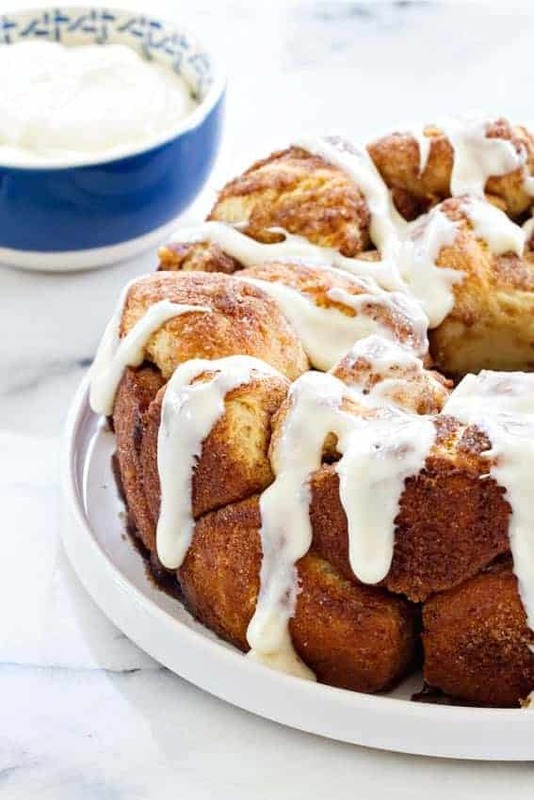 Drizzle icing over warm pull-apart bread. Serve immediately. I have tried at home and my children very loved it & can’t stop eating. You are very welcome, Stefani! You made my day! This looks great. To reduce the effort, just use remade dough. I’ve enjoyed both ways! Take care! Sounds scrumptious, must make it. I buy Fleishman’s Yeast by the jar, which I keep in the freezer, it is not Rapid Rise though. Do not trust any other yeast product. I hope you enjoy it! Fleishman’s Yeast is amazing. Take care! This looks so delicious! I could really go for this right now, I have to share it with my readers! Thank you for sharing this recipe! Love this Jamie…I love how simple it is too! OK…your ads are just annoying now. They won’t go away, can’t close them out and the page, popping up everywhere and the page just won’t…stop…loading! Ok…rant over, sorry, lol the frosting looks really good on this! Thanks so much for your feedback. Unfortunately, ads are part of the income that earn from blogging as a full time gig. However, they definitely should not be impeding your ability to read text, or refusing to close. I’ve sent a message to my ad network to see if something wonky is going on. I really hope you enjoy the bread and all that yummy frosting. Have a great weekend. I am beyond obsessed with scratch Monkey Bread. My kids will love this recipe and your pictures are gorgeous!! Thanks so much, Shelly! I hope the kiddos love it! I haven’t made monkey bread with REAL homemade, from scratch bread in years. And this makes me want to bake right now!! Gorgeous photos! Oh, it’s so easy, Aimee! I think you’ll it! You got this, Aggie! So easy and soooo good! Thanks for stopping by! Looks fun to make and fun to eat! It most definitely is, Barbara! Thanks so much for stopping by! we love pull-apart bread!! these photos are stunning Jamie! I would eat this all day long!! Love that it’s from scratch. You and me both, Dorothy! Thanks so much for visiting! I want to make this! I’ve never made pull apart bread, and this would be perfect for the kids!! It’s so easy and I promise you’ll love it! Thanks for stopping by! 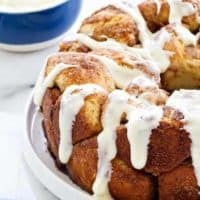 I’ve been looking for a Monkey Bread from scratch recipe for quite some time now. It looks delicious and I’m going to make it for breakfast tomorrow. Is it possible to make ahead the recipe, let it rise overnight and bake it the next morning? Hi, Ioanna! I would give it a try! You can put it in the refrigerator and then pull it out the next morning. Let it rise for about an hour before you put it in the oven. Let me know how it turns out! I’ve made it and it was amazing. I’ve made it ahead and I let it rise overnight covered with a clean towel inside the (cold) oven. Kid’s loved it! Thanks for the recipe! You are so welcome! I’m glad your children enjoyed it! Looks delicious I’m Surely gonna make it.. I hope you enjoy it, Maricela!